Fighting what you view as government tyranny with an AR-15 makes you a murderer, not a Minuteman. In Dallas last week, Micah Johnson offered a real-world example of a law-abiding citizen taking up arms to fight what he perceived to be a government that was trampling the rights of its citizens. In reality, it looked like a bloody mass murder of a bunch of cops who were just doing their jobs. But make no mistake: Johnson was acting on one of the central beliefs that animates the gun rights movement. 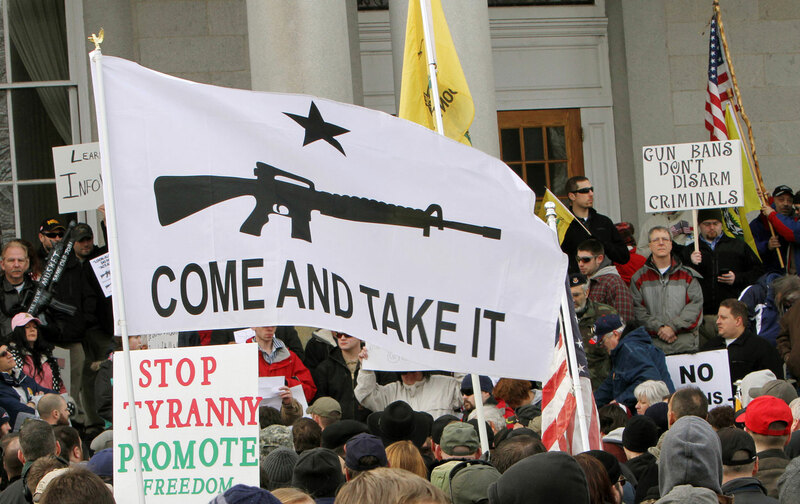 It’s been called the “insurgency theory” of the Second Amendment, and it holds that Americans must have the right to own military-style weapons because a heavily armed populace is the last bulwark against a tyrannical government running amok. Their English heritage, and especially their awareness of the excesses of Cromwell’s New Model Army, taught them that standing armies could be tools of a tyrannical monarch or a rogue military commander. Their apprehension gained a solid a posteriori basis when British regulars were used to quell the spreading dissatisfaction with colonial rule…. The linchpin of the scheme to counterbalance the potentially dangerous standing army was an armed citizenry, a force [Anti-Federalists] considered superior to any body of regular troops that could be raised in the United States.… Among the solutions the Framers devised to ensure that state-based militias remained effective and free from federal encroachment was the Second Amendment. It’s not the 18th century, and today most people take it as a given that modern states have standing armies, but the theory that ordinary people need access to military-style weapons to stave off tyranny persists among American gun-rights absolutists. It inspires the militia movement, and the Oath Keepers—former soldiers and law-enforcement officers who vow to resist laws they consider to be unconstitutional, by force if necessary. It formed the basis of the armed standoffs with federal law enforcement by the Bundy family and their supporters at their Nevada ranch in 2014, and again in Oregon earlier this year. Micah Johnson was what Wayne LaPierre might call a “good guy with a gun”—a combat veteran with no criminal record. He clearly believed that “a situation [had arisen] when the government grossly violates the rights of American citizens.” He was reportedly “upset about the recent police shootings” of Philando Castile in a suburb of Minneapolis and Alton Sterling in Baton Rouge. A neighbor said Johnson was a “good kid” who “just snapped” last week, after watching one too many videos of black men being shot down. The NRA’s “insurgency theory” fantasy rests on the idea that “patriots” will rise up in unison against government tyranny. But the reality is that firearms have never been a bulwark against tyranny; we’ve maintained a constitutional government for 230 years because of the separation of powers—because the Framers divided power between co-equal branches of government that serve as checks on any branch gaining absolute power. They set up a Supreme Court to litigate disputes that arose from the Constitution. An independent judiciary that can, and frequently does, overturn laws that conflict with the Constitution and which can, and often does, check the power of the executive branch, negates the whole premise that the public needs AR-15s to engage in an armed uprising if necessary. Moreover, from the signing of the Constitution to this day, we’ve never had any consensus about the proper role of the federal government. So whether you share the delusions of Micah Johnson or LaVoy Finicum—whether you think you can stop police brutality or the Bureau of Land Management with a gun—you’re not going to lead “the people” to rise up behind you. The most you can do, as we saw so tragically in Dallas last week, is kill some cops.